This Lip Balm Just Got A Majorly Sweet Upgrade! Ready to see what the new Baby Lips lip balms look like? What’s one thing you always need to have in your kikay kit? Yup, it’s totally a trusty tube of lip balm! It’s a staple in every girl’s makeup bag not only because we all want soft, hydrated lips throughout the day, but also because even a little swipe of subtle color can complete an awesome #selfie. But if you’re getting bored with the traditional lip balms you have with seemingly ordinary and repetitive colors, you’ll be glad to hear that your most loved color cosmetics line, Maybelline New York, has released a new range of sweet colors in one fun lip balm pen called the Baby Lips Candy Wow Lippies. The new Baby Lips Candy Wow lippie comes in trendy bright, candy hues that add a saccharine touch to your daily makeup routine. It's formulated with 12-hour moisturizing cream to keep lips hydrated throughout the day, with a fruity fragrance and glossy finish. These pen lippies come in five different shades: Raspberry, Mixed-berry, Orange, Cherry and Peach. Best part? You can grab these new lip treats for only Php179! 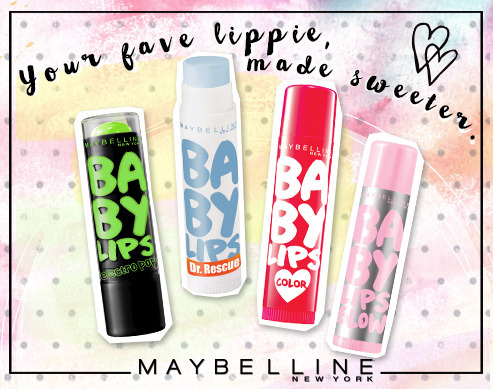 The new Baby Lips Candy Wow lippies are exclusively imported and distributed by Maybelline New York and are available nationwide at all Maybelline counters. Learn more about it by clicking here!